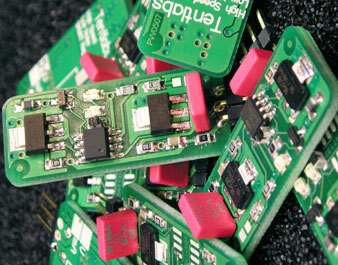 Traditionally, voltage regulators never where designed for audio applications. As an example, the very popular 7805 initially was designed as a voltage regulator for digital logic and low micro controllers - who cared about bandwidth or output noise. Derrivatives like 7815 and 7915 are widely used to supply the analogue output stage of CD players. About time for an upgrade! The shunts consist of an active wide band current source to isolate the input from the output. The output is regulated by an active shunt regualtor with both low output noise and wide active bandwidth. For RF frequencies, a Wima capacitor is integrated on the board, which measures 15*35 mm. Using the shunts is also beneficial in terms of additional decoupling: All output electrolytics can be left out! Read the Application Note for more information. If you order a low jitter DIY clock oscillator and a shunt, shipping is free ! • Supply input: typically 5 V above output voltage, maximum 10 V above output, to minimise heat. All versions € 32.77 each ex VAT, € 39 each incl. VAT. All ex shipping cost. A 5-pack is priced at € 147.06 ! ex VAT, € 175 each incl. VAT. All ex shipping cost. All regs come fully assembled and tested with a 5-year full warrantee, assumed they are mounted and used according instructions.